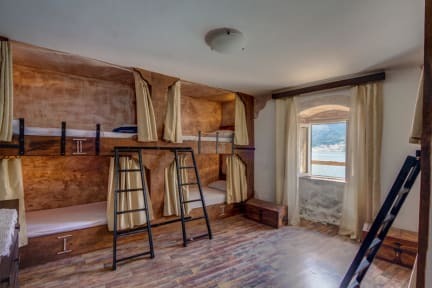 Stranger Tides Hostel i Kotor, Montenegro: Bestill nå! Our place is perfect for solo adventurers, business travellers, families with kids, groups and couples, who need accommodation with great location at low cost. You can rent a bed, a room, or entire house depending on availability. We are located at the seafront in beautiful Fjord of Boka Bay that offers stunning views as well as many exciting walks and tours. This property has been home to our family for many generations. The original stone house/museum was built over 1000 years ago, in the Mediterranean style typical to this region. Dobrota is a residential Kotor neighborhood, just outside of Old Town. The hostel is situated few meter of the sea. Our surroundings are tranquil and peaceful - perfect for a romantic getaway, or for relaxation after a long day of sight-seeing. Access to the sea is about 150 meters downhill, where you can do as the locals do and dive into the sea from the many 'pontas' lining the coastline. Famous beaches 'Orahovac', 'Plavi Horizonti', 'Bajova Kula', and 'Jaz' are within a 20-40 minute drive. While developing our property, which now includes Stranger Tides Hostel, we maintained the look and design to match the original build of the house, working with local stones and wood for all the exteriors of rooms so the rooms looks like a rooms in big old ship of 17 century. The interiors are hand made, clean and elegant! Reception work from 07:00 till 02:00.